Yesterday I shared with you a window seat that I transformed using contact paper. I wasn't thrilled with the drop cloth I had the cushion covered in. Here's what I found at Target. The fabric for the cushion is actually an 84" window treatment I bought for $16.99. It's a nice weight fabric, perfect for the seat. For now I have just wrapped it around the cushion like I would wrap a gift. The pillows are also from Target. They actually were a little pricey at $35 each, but they are down filled and are a nicer than average fabric too. The wood blind you see on the wall is actually where our dehumidifier stands. We are getting rid of it and putting in an air conditioning system to reduce the amount of humidity in the basement. I eventually want to close off the hole in the wall, but for now I decided to just make some wall art to cover it. 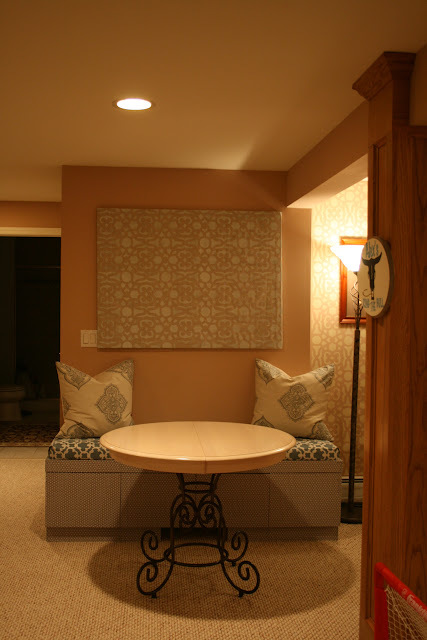 All I did was use the same stencil I used on the pool table wall and stencil drop cloth in a blue color. I moved the other pictures to another wall and hung it over everything. The lighting is really an issue in in this basement. It's next to impossible to get a decent photo. Do you like the fabric and pillows or could I do better? Don't forget there is still time to enter my Cutting Edge Stencil Giveaway. I LOVE those pillows, Judy! 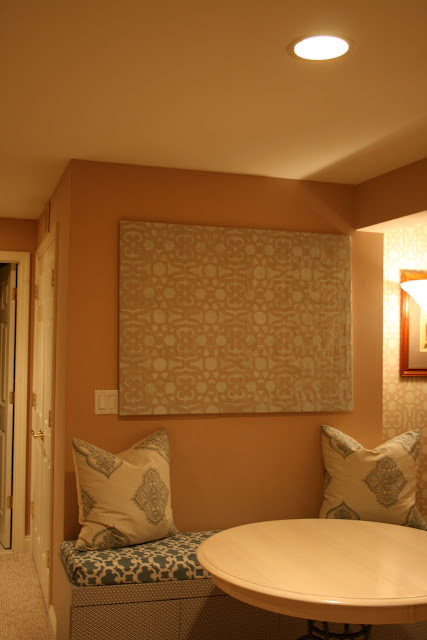 Well worth the splurge with the savings I think you got on the drapery panel for the cushion cover. What a pretty little space! 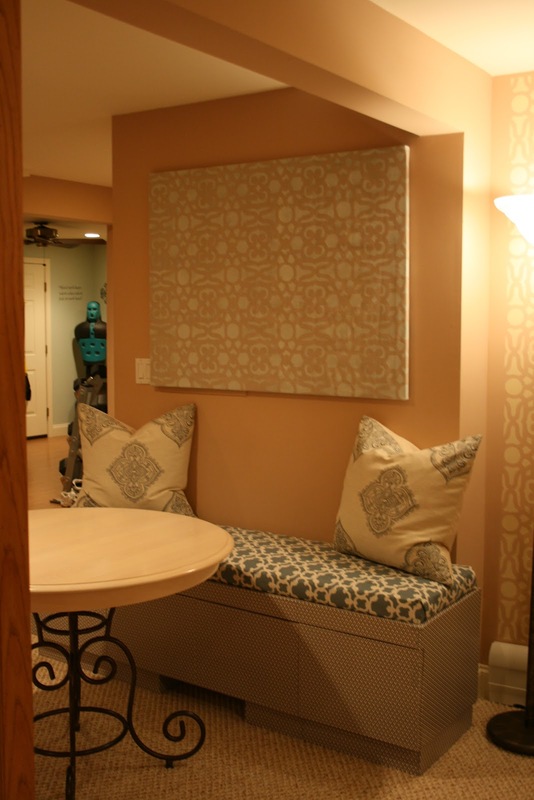 I love the material on the bench cushion as well! I just purchased the same pillows last week at Target and LOVE THEM! I couldn't be happier. Yours look great with the coordinating fabric, thanks for the inspiration to step it up a notch! I love it! 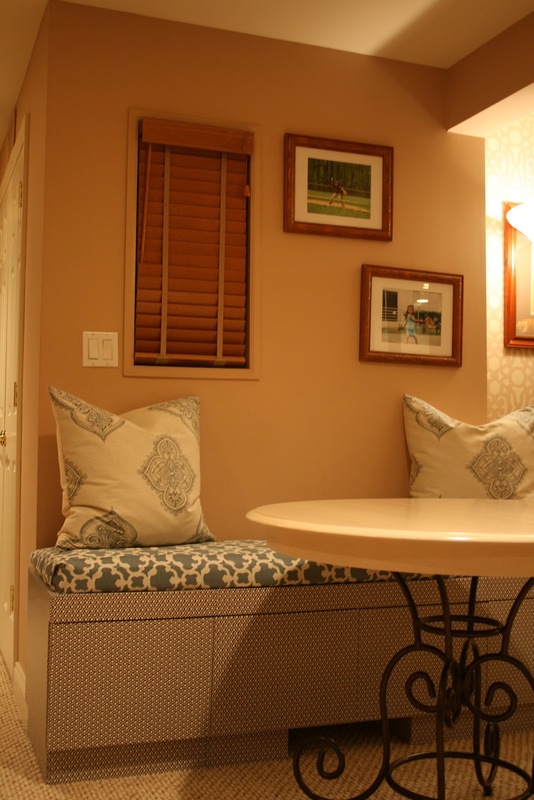 What a cozy area....it makes me want a cup of tea :) The fabrics go so well together! I love the look...the fabric is beautiful...Yes, at $35 it may seem a bit pricey for pillows, but you can pay that for a pillow cover at Pottery Barn and have to buy the insert!...I think the pillows are great...Love this cozy area! !